“Even a child in India, if asked who’s India’s best friend, will reply it is Russia because Russia has been with India in times of crisis… I felt I was in India when I visited Russia’s Astrakan region,” PM Narendra Modi told President Vladimir Putin when they met on the sidelines of the BRICS Summit. “Even a child in India, if asked who’s India’s best friend, will reply it is Russia because Russia has been with India in times of crisis… I felt I was in India when I visited Russia’s Astrakan region,” Prime Minister Narendra Modi told President Vladimir Putin when they met on the sidelines of the BRICS Summit to expand the scope of bilateral strategic partnership that has stood the test of time. During the 40-minute meeting, Modi sought Putin’s support to broaden cooperation in the defence, nuclear and energy sectors. As Putin offered help to build more nuclear plants in India, Modi invited the Russian strongman to visit Kudankulam power project when he visits the country in December for the annual Summit. Putin responded to the invitation positively. This was the first meeting between the two leaders after Modi became Prime Minister. The Unit-I at the Kudankulam project has started producing electricity and the second one will become operational in December. Moscow has already extended Line of Credit for Units three and four at the same project and four more reactors could be added at Kudankulam. India and Russia have drawn up a roadmap for 22 more nuclear reactors in the country. Modi described Russia as India’s top foreign policy priority and said he would visit Moscow next year, sources in the Prime Minister’s Office told ET. The two leaders met late on Tuesday night at Fortaleza after their Monday meeting was deferred because of Putin’s engagements in capital Brasilia. Putin congratulated Modi on his victory in the recent elections. Interestingly, the Indian PM spoke in Hindi during the meeting, which is not a hindrance for many Russian diplomats who are fluent with the language. Modi, who had met Putin in 2001 in Moscow, said India’s relationship with Russia is a time-tested one and appreciates that it has been so since early independence. It’s also little known that Modi had visited Russia thrice in the past as Gujarat Chief Minister. Emphasising the need for greater people-to-people contact, Modi said there was need to look at a liberal visa regime, especially for students going abroad for studies. President Putin acknowledged that the issue needs to be looked into, MEA spokesman Syed Akbaruddin told reporters after the meeting. Modi fondly recalled his visit to Russia’s Astrakan region in his early days as Gujarat CM, which has ties with that area. Talking about the visit, he said that he felt as if he was in India. 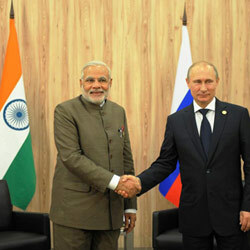 Putin, on his part, said Russia places its relationship with India high enough in the strategic framework. Modi appreciated Putin’s speech at the BRICS Summit, saying it was clear on issues like reforms of the UN Security Council and international financial organisations. The two leaders also discussed regional and global challenges, including the situation in Iraq, Syria and Afghanistan. A number of important bilateral fora will take place by the end of this year, such as the sessions on two Inter-governmental commissions — on military cooperation and on trade and economy — with Defence Minister S Shoigu and Vice-Premier D Rogozin visiting Delhi. Foreign Minister S Lavrov will precede the most important political event, the annual Summit, to be held in Delhi in December. A roadmap for the bilateral relations will be fixed at that Summit.